Boulder Brook is an active adult community in Prospect, Connecticut. Residents enjoy the natural surroundings of this neighborhood with walking trails that lead to a scenic pond. With just 35 attached homes, homeowners can relax in this peaceful and close-knit community with a homeowners’ association (HOA) maintaining common areas. Located a short distance from both New Haven and Hartford, Boulder Brook is perfectly located to experience all of Connecticut. A clubhouse at the community’s center provides a meeting room for residents to gather for activities or rent out for social events. A catering kitchen is also available to prepare food for parties. Outside, a nature trail runs adjacent to Boulder Brook and a small pond lies southwest of the community. Construction in Boulder Brook began in 2004 and concluded in 2006 with 35 attached homes. These homes range in size from 1,455 to 1,710 square feet and have two bedrooms, two or two-and-a-half bathrooms, and an attached one or two-car garage. Features in some homes include kitchen islands, walk-in closets, and gas fireplaces. Residents can relax with the HOA providing lawn care, snow removal, and exterior home maintenance. A low-maintenance lifestyle gives homeowners more freedom to socialize with neighbors, spend time on hobbies, or travel. Boulder Brook is located a short drive away from grocery stores, shopping centers, and pharmacies. Plenty of restaurants are found in downtown Prospect and within the larger city of Waterbury. Golfers have a long list of courses to try out in the region, including East Mountain Golf Course, Hop Brook Golf Course, and Western Hills Golf Course. With convenient access to I-84 and CT-69, Boulder Brook is about a 40-minute drive from both New Haven and Hartford. 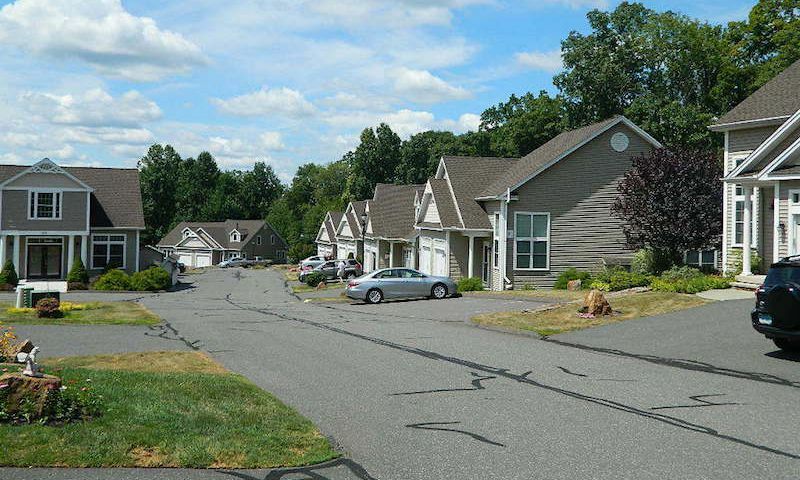 Active adults looking for a cozy, low-maintenance neighborhood in the woods will find a lot to love about Boulder Brook in Prospect, CT. Check back soon for more information on the lifestyle in Boulder Brook. Construction in Boulder Brook began in 2004 and concluded in 2006 with 35 attached homes. These homes range in size from 1,455 to 1,710 square feet and have two bedrooms, two or two-and-a-half bathrooms, and an attached one or two-car garage. Features in some homes include kitchen islands, walk-in closets, and gas fireplaces. Please Note: Floor plans are not available at this time. 55places.com is not affiliated with the developer(s) or homeowners association of Boulder Brook. The information you submit is distributed to a 55places.com Partner Agent, who is a licensed real estate agent. The information regarding Boulder Brook has not been verified or approved by the developer or homeowners association. Please verify all information prior to purchasing. 55places.com is not responsible for any errors regarding the information displayed on this website.